October just passed me by.... Halloween was quiet, but fun. Veronica woke up sick Tuesday morning, so she missed school. I thought for sure it was the dreaded flu, but thankfully it was not. Just a touch of bronchitis and perhaps strep, but she was feeling good enough to trick-or-treat. Clint and I dressed up as 1985 Prom King & Queen. It was pretty funny! 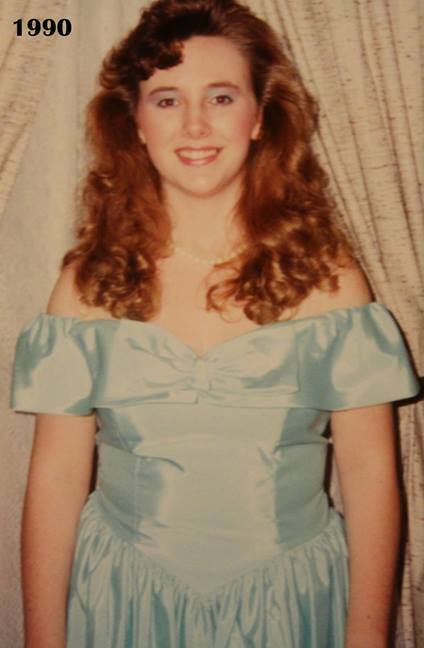 That is my actual prom dress from 1990. Yep, 27 years later.... HA! Both Valerie and Veronica had almost the same costume but they were different characters from this anime they watch called "Attack on Titan." Don't ask me who because I don't know. We had posted an open invitation on Facebook to any of our friends who wanted to come hang out with us, but not a one who said they would come by did. That's okay though. We did have a surprise visit -- one of Valerie's long lost friends who moved away years ago popped up. She hung out with us (along with her family,) and Valerie was SO happy to reconnect with her friend. They certainly picked up right where they left off 3 years ago. Clint stayed behind to run the light show and hand out candy. We got tons of compliments on the lights and heard that people are talking about 'that house in Bayou Blue." We were also in the newspaper again, so I guess that makes us a little bit famous! Hope you all had a safe and Happy Halloween!